On this date in 1931, Libyan independence martyr Omar [al-]Mukhtar was publicly hanged by the Italians at their concentration camp in Suluq. Mukhtar (English Wikipedia entry | Italian) was born an Ottoman subject back in 1858 and had lived long enough to see his native Libya seized in the 1911-12 Italo-Turkish War. 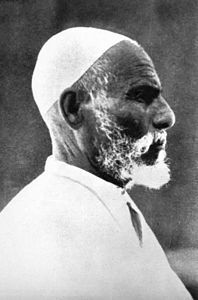 Mukhtar, a religious teacher and follower of the Senussi movement, became the leader of the Libyan resistance that dogged the Italian occupation. 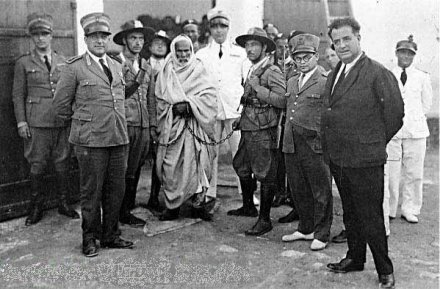 Mukhtar proved an energetic and successful desert guerrilla fighter, and he had to be given the Italians’ mechanized military. 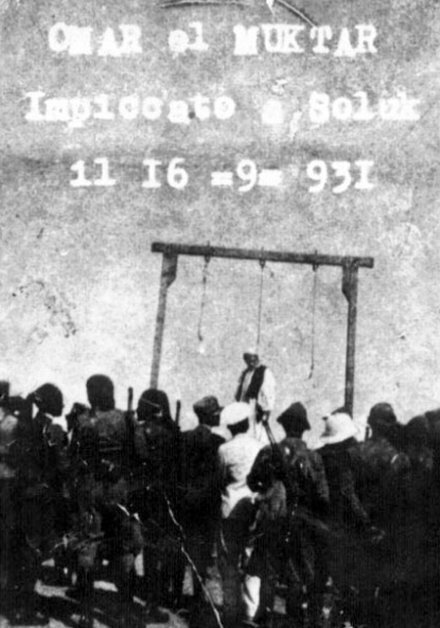 The Italians executed an estimated 4,000 Libyans in the 1920s, and drove hundreds of thousands into concentration camps, and gradually, only gradually, gained the upper hand on their adversaries. Captured in battle after he abandoned a 1929 truce, Mukhtar was denied prisoner-of-war status and subjected to a snap military tribunal in one of the small coastal enclaves actually controlled by Italy — “a regular trial and consequent sentence, which will surely be death,” as the Italian general directed. It surely was. He’s played by Anthony Quinn in the 1981 film Lion of the Desert — a better movie than you might think given that it was bankrolled by Muammar Gaddafi. His steely profile can be seen on Libya’s 10 10 dinar note. On this date in 1767, a larcenous bank clerk was hanged at Tyburn for robbing the till. Sleigh ride: Detail of a studious William Guest being drawn to Tyburn (click for full print). In this case, it wasn’t anything so gross as grabbing the money and running. No, our malefactor William Guest — the “son of a clergyman of unblemished character” whose “constant handling of gold [for the Bank of England] shook his integrity” — started milling the edges of the guineas he handled and innocuously returning them to the bank’s stock whilst piling up his own supply of gold filings. It’s sort of the pre-digital version of the Office Space scheme: “I’m just talking about fractions of a penny here, but we do it from a much bigger tray. A couple of million times. So what’s wrong with that?” Literal profit on the margin: perfect for the FIRE sector. 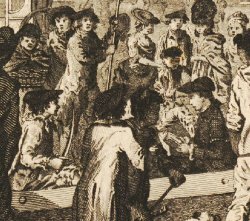 Though 18th century London’s perpetual necktie party was obviously focused on the lowest classes, its busy gallows had room enough for the occasional white-collar crime. 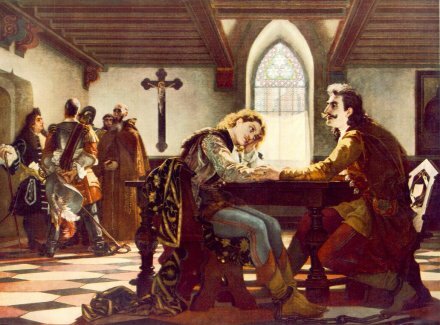 And by England’s lights, debasing the currency was as serious a crime as there was: Guest’s conviction wasn’t for larceny or fraud, but for treason. 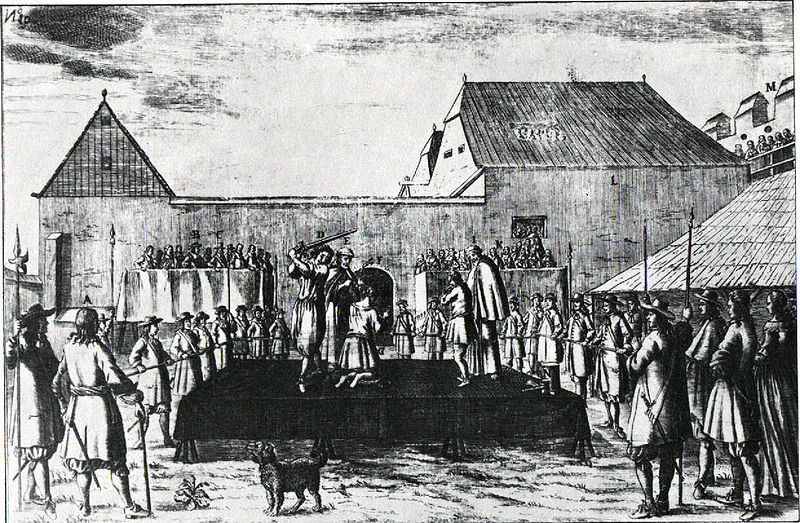 Because of that, he didn’t get the plain-old cart ride to the gallows, but was drawn on a sledge — the “drawn” bit of “hanged, drawn, and quartered,” although for this penny-shaver the execution itself didn’t entail the horrible quartering. Australian liberal campaigner Edith Cowan — a notable suffragist, and later an activist for disadvantaged children — enjoys the distinction of being her country’s first female Member of Parliament. But Cowan was disadvantaged herself in her own childhood by the hanging on this date in 1876 of her father, explorer Kenneth Brown. While Kenneth entered this world in England, his family emigrated to Australia in his infancy, and there established the pastoral outpost Glengarry Station. Is this sufficient to justify a wholly unrelated excerpt from Glengarry Glen Ross? Reader, it is. Kenneth Brown would come to spend a lot of time at that station, in between jaunts exploring Western Australia. Edith Cowan — nee Edith Brown, obviously — was born there, though her mother (Brown’s first wife) died in childbirth a few years later. Brown’s remarriage to Mary Tindall was less than an unqualified success. Even “crippled” by the family tragedy, Edith went on to earn the Order of the British Empire and grace Australia’s $50 note. Edith Cowan isn’t the only notable family connection for this date’s featured act: Kenneth Brown’s younger brother was politician Maitland Brown, infamous to Australia’s aboriginals as the leader of the La Grange expedition/massacre. 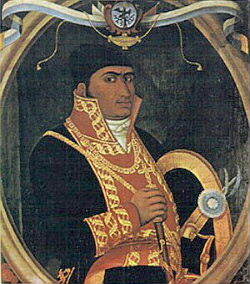 On this date in 1815, the Catholic priest turned revolutionary leader Jose Maria Morelos was shot for rebellion. 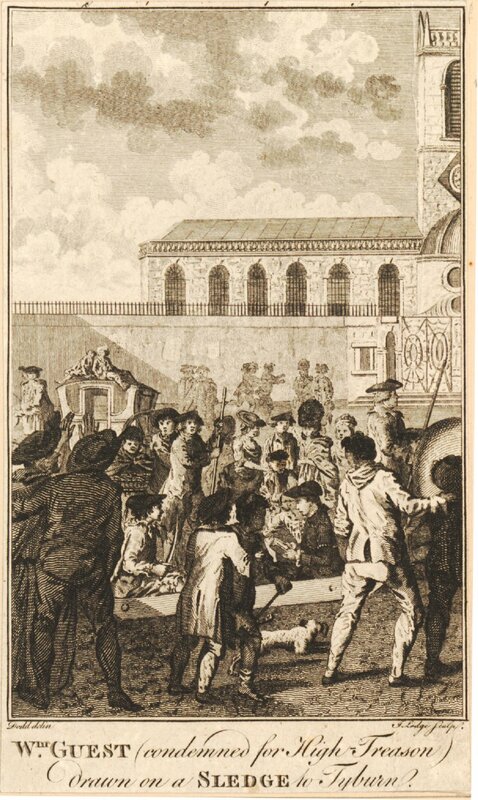 Morelos was born in New Spain — the town of his nativity was posthumously named in his honor — and entered adulthood a humble agricultural laborer* before engaging the career in letters necessary to undertake Holy Orders. 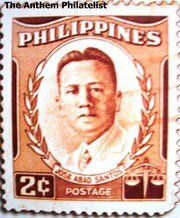 Designated to save his countrymen’s souls, he proposed instead to save their liberties and ungratefully joined up with fellow-priest Miguel Hidalgo when the latter sounded the tocsin for the Mexican War of Independence. Morelos distinguished himself rapidly in the revolutionary army, and upon Hidalgo’s capture attained its leadership, complete with Generalissimo status. 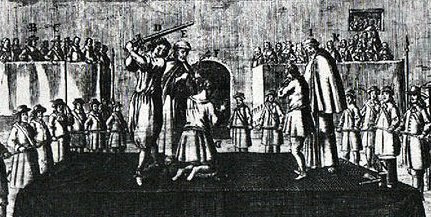 Upon capture, he was handled first — and rather meticulously — by the Inquisition, which defrocked him in an auto de fe before relaxing him to the secular authority for the inevitable punishment. 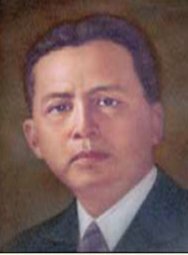 Without a dissentient voice it [was] agreed that … [Morelos] be declared guilty of malicious and pertinacious imperfect confession, a formal heretic who denied his guilt, a disturber and persecutor of the hierarchy and a profaner of the sacraments; that he was guilty of high treason, divine and human, pontifical and royal … his property should be confiscated to the king … His three children were declared subject to infamy and the legal disabilities of descendants of heretics. Nobody said being a national hero was easy.